The following is an excerpt from Pat Speer's on-line book, A New Perspective on the Kennedy Assassination. "Legacy of a Lie" is a sub-section of Chapter 10, "Examining the Examinations" (scroll down from the top to find it); it takes a hard look at the claim made by Howard Willens that Robert Kennedy obstructed the Warren Commission's access to the autopsy photos and X-rays, and uncovers it as a fabrication. The 50th anniversary of Kennedy's assassination added another chapter to our ongoing discussion of Kennedy's back wound, and the probability Warren Commission counsel (and future Senator) Arlen Specter deliberately lied about its location to help prop up the single-assassin conclusion. In his 2013 book, A Cruel and Shocking Act, New York Times reporter Philip Shenon revealed that he talked to Specter shortly before his death in October 2012 and asked him about his viewing the back wound photo before the May 1964 re-enactment. Specter's answer to Shenon was most illuminating, but the substance that was illuminated was strangely missed by Shenon. Specter reportedly told Shenon that he'd assumed Warren had asked Secret Service Inspector Thomas Kelley to show him the photo in order to "placate" him. Well, heck, that rules out Specter's not saying anything about the photo to the rest of the commission because he didn't want Warren to know he saw the photo. And that's just the beginning. Reportedly, Specter also told Shenon that the photo he wanted to see in order to confirm the relative accuracy of the face sheet (which showed a wound on the back) and the Rydberg drawings (which showed a wound at the base of the neck) "resolved nothing" as the photo failed to show Kennedy's face. Reportedly, Specter then proceeded to complain that "I know what evidence is" and that his being shown the photo (which shows a wound on the back) in that manner was a "bunch of horseshit." Still, his influence over Shenon seems apparent. When discussing Specter's 3-11-64 meeting with the autopsy doctors (which Shenon mistakenly places on 3-13-64), Shenon reports: "As the autopsy continued, the pathologists could see that the muscles in the front of the president's neck had been badly bruised--proof, they thought, that the bullet had passed through his neck and then exited out the front." But this, as we've seen, is gobbledygook. Humes made this clear in his testimony. The bruising of the strap muscles led Humes to suspect the neck wound was a missile wound. Period. It was not "proof" the bullet exited out the front. Perhaps in the elderly Specter's desperately defensive mind...but that doesn't count for much and an experienced journalist like Shenon should have known as much. Specter's original memo on this meeting, we should recall, presented a different scenario: "They noted, at the time of the autopsy, some bruising of the internal parts of the President's body in the area but tended to attribute that to the tracheotomy at that time." It's really quite clear, then. As "the autopsy continued," the doctors did not see the bruising of the strap muscles as "proof" the bullet came from behind, Specter should not have told Shenon as much, and Shenon should not have repeated something which a mere modicum of research--such as reading Specter's memo on the meeting--would have proved to be inaccurate. And that's not the last time Shenon, presumably unwittingly, buys into Specter's re-writing of history. A few pages later, while discussing Humes' testimony, Shenon discusses Specter's attempts at gaining access to the autopsy photos. He relates: "Humes had tried to be helpful by bringing along diagrams of the president's wounds prepared by a Navy sketch artist at Bethesda, but both he and Specter knew the drawings were based on Humes' imperfect memory." Well, this hides that 1) these drawings were created at the request of Joseph Ball, as well as Specter; 2) Ball had previously noted that the back wound appeared to be lower than the throat wound, and that this was a problem for the Oswald-did-it scenario; 3) the back wound in these drawings was now much higher than the throat wound; and 4) Specter induced testimony from Humes which suggested the measurements obtained at autopsy were used in the creation of these drawings, and that the drawings were therefore reasonably accurate. It seems likely, then, that Shenon was too enamored with Specter to find what needed to be found, and see what needed to be seen. Specter had provided him access, and was thus granted a free pass. His questionable behavior was never even questioned. It seems likely, for that matter, that Shenon wasn't the only one determined to defend Specter and the commission. 2013 also saw the release of History Will Prove Us Right, former Warren Commission attorney (and Specter college chum) Howard Willens' spirited defense of the commission. I took an interest in this book in October of that year, and was put in contact with Willens through an intermediate. Within our first exchanges, Willens was friendly enough; he readily acknowledged that the wound in the photo shown Specter was a back wound, and not a wound on the back of the neck. And yet, he expressed no interest in second-guessing Specter's actions while working for the commission. Not unlike Shenon with Specter, I suppose, I gave him a pass. In November, however, I saw him on CNN, in its Bugliosi-fueled program The Assassination of President Kennedy. There, he described the back wound of our discussions as a wound "in the back of the neck." This surprised me. I wrote Willens pointing out his mistake, and received a response in which he acknowledged it as a mistake and once again admitted it was a back wound, and not a wound in or on the back of the neck. I once again gave him a pass. I was probably being too generous. A 12-11-13 article in the Hudson Hub Times reported on a recent appearance by Willens at the Hudson Library in which he discussed the assassination. When asked about the commission's mistakes, he acknowledged: "Some of the diagrams were inaccurate." He then added: "Someone testified Kennedy was shot in the back of the neck but it was the back of the upper shoulder." Well, this came as another surprise. Was Willens really trying to push that the Rydberg drawings were inaccurate because the commission had been deceived by "someone's" inaccurate testimony? Now, one, this was but weeks after Willens himself had made an appearance on CNN in which he himself claimed Kennedy was shot in the back of the neck. So that's strange right there. I mean, was he also trying to blame "someone" for his more recent mistake? And, two, well, by blaming this mistake on "someone", Willens was concealing that this someone was Dr. James Humes, Kennedy's autopsist, and that Humes had been asked by the commission to explain how a bullet striking Kennedy's back could have exited his throat, and that he then, and only then, started claiming the wound was really in the back of the neck, and that, furthermore, oh yeah, Earl Warren and Arlen Specter at the very minimum looked at the autopsy photo, and knew for a fact this wound was really in the shoulder, and not the neck, well before the commission's report, in which this wound was repeatedly called a wound on the back of the neck, was published. And Willens knew all this, moreover, because I had discussed this with him in a series of emails written but weeks before his appearance at the Hudson Library. When I finally got around to reading Willens' book, for that matter, I found much much more that was suspicious. On page 53, while discussing the Warren Commission's review of the FBI's report on the assassination, Willens relates: "One major issue that came up right away was the bureau's preliminary finding regarding the bullets that struck President Kennedy and wounded Governor Connally. The FBI concluded that two bullets had struck the president and a third had wounded Connally. To support this assessment, the FBI relied in part on the initial, but inaccurate, information from Parkland Hospital that the first bullet that hit Kennedy had not exited from his body." Well, geez, as pointed out by writer Martin Hay in his devastating review of Willens' book, this is one of the most disturbingly inaccurate passages ever written about the medical evidence by a supposedly credible source. The Parkland doctors thought the throat wound was an entrance, and wondered if this bullet lodged in Kennedy's body. The FBI, in its report, made no reference whatsoever to this wound, and discussed instead a shallow back entry wound, which the autopsy doctors told them represented a wound made by a bullet that DID NOT enter the body. Willens' "error", then, concealed that the autopsy doctors, upon whom the commission relied, could not find a passage into Kennedy's body for the bullet the commission would later claim passed through both Kennedy and Connally. And this was no isolated incident, mind you, but the beginning of a disturbing pattern in which Willens concealed problems with the commission's work, and Specter's work in particular, from his readers. On page 170, Willens quotes liberally from Norman Redlich's April 27 memo describing the need for a re-enactment of the shooting. He skips over the following passage, however, in which Redlich's higher purpose is highlighted: "We have not yet examined the assassination scene to determine whether the assassin in fact could have shot the President prior to frame 190. We could locate the position on the ground which corresponds to this frame and it would then be our intent to establish by photography that the assassin could have fired the first shot at the President prior to this point. Our intention is not to establish the point with complete accuracy, but merely to substantiate the hypothesis which underlies the conclusions that Oswald was the sole assassin." On page 150, Willens briefly discusses the April 30 Executive Session of the commission, and relates "Warren also seemed receptive to Rankin's proposal that a doctor and a commission member examine the autopsy photographs and X-rays so as to ensure the accuracy of the testimony of the autopsy doctors who did not have those materials available when they testified, but that the materials would not be included in the public record of the commission's proceedings." Note that he writes "seemed." Well, this avoids that Warren did not "seem" to agree, but did agree that such an inspection could occur. That this inspection was forthcoming is also avoided by Willens' failure to cite that "Rankin's" proposal was brought about by a memo from Specter, in which Specter stressed the necessity of viewing the photo of Kennedy's back wound so that the precise location of the wound and the precise trajectories of the shots could be calculated during the re-enactment. Willens makes no mention, moreover, of the May 12 memo from Specter which starts off "When the autopsy photographs and x-rays are examined, we should be certain to determine the following..." and thereby suggests that Specter had been told such an inspection was about to take place. On page 199, Willens writes: "Securing testimony from Mrs. Kennedy had been difficult, but getting our hands on the autopsy photographs and X-rays proved even more so. Although the public might accept our delicate handling of Mrs. Kennedy, we doubted they would be sympathetic to our failure to get the hard evidence that the autopsy materials represented. The Kennedy family had deep, long-term, emotional interests at stake but, for us, it was much more difficult to take a pass on this issue. We all believed we could not back down. Most of the staff was convinced that the commission's failure to consider these materials carefully in its report would be used to attack our competence and integrity. Specter had taken the testimony of the three autopsy doctors three months earlier, at a time when neither he nor the doctors had access to the autopsy photos and X-rays. He and others were satisfied that the testimony of the doctors did accurately reflect the trajectory of the bullets and the nature of the wounds suffered by both Kennedy and Connally. However, the corpsman's sketch introduced during this testimony was inaccurate as to the location of the wounds and to that extent inconsistent with that testimony." WAIT. WHAT? While trying to defend the integrity of commission's staff, Willens lets on that they knew the "corpsman's" sketch--an obvious reference to CE 385--was inaccurate and inconsistent with the testimony of the doctors. Well, geez, this is interesting, seeing as NONE of these bastions of competence and integrity EVER said ANYTHING to indicate they'd thought the "corpsman's" drawings were inaccurate in the years after the assassination. And worse, far worse, this suggests that when Dr. Boswell in 1966 and Dr. Humes in 1967 went public, at the urging of the Johnson Administration Justice Department, to claim their review of the autopsy photos proved the drawings were accurate, "most" of the Warren Commission's staff knew they were blowing smoke. Willens then proceeds to describe the memos written by Specter when he was preparing for the re-enactment. Willens then admits "At the commission meeting of April 30, Rankin obtained Warren's approval to try and obtain access to the X-rays and photos." On page 200, he continues: "Unknown to Specter, the question of the commission's access to these materials was still unresolved when I met with Katzenbach on June 17." Well, this avoids that Specter was shown the back wound photo on May 24. In our personal correspondence, Willens told me Specter never told him he saw such a photo during the life of the commission, nor at any other time. And he also claimed that as of 1966 he didn't even know Specter had been shown the photo. But Willens had clearly read Specter's book. And he'd clearly taken notes. This leads me to suspect, then, that when writing his own book Willens knew full-well that Specter had viewed the back wound photo, and that he knew how this would appear to his readers, and that he thereby opted to leave this out of his narrative. Willens continues: "I understood at this time that the attorney general had agreed to let Warren and Rankin see the autopsy materials. I urged Katzenbach to get Kennedy's approval for Specter rather than Rankin to examine them. I told him it was very important to have the most knowledgeable lawyer on the staff assume this responsibility and that Specter was known to the attorney general as the prosecutor who had successfully won the Roy Cohn Teamster case in Philadelphia." Well, this is also kinda suspicious. Specter's memos and the transcript of the April 30 executive session of the Warren Commission reflect that Specter's--and Rankin's--interest was in getting Dr. Humes access to the autopsy materials in order to confirm the accuracy of his testimony and the exhibits he'd had created. Willens mentions this on page 150. So why is Willens on page 200 telling his readers that the issue was getting Specter access to these materials? Was Willens trying to avoid that Warren had prohibited Dr. Humes--the man who'd pulled Kennedy's brain from his skull--from taking a quick peek at a photo of Kennedy's back? "Katzenbach raised the question a few days later with Kennedy, who decided that Warren could view these materials on behalf the commission, but that no one else could be present and the X-rays and photographs would remain in the possession of the custodian who brought them. Kennedy was understandably wary of an opportunity to copy them." Now, this is strange. Katzenbach was deposed by the HSCA's Gary Cornwell on 8-4-78. He told Cornwell that Robert Kennedy's attitude towards the Warren Commission's investigation was as follows: "He found parts of it distasteful, maybe what Jackie did, I do not know, the whole autopsy business, revealing all that medical information he just found extremely distasteful. I would say I would have also under the circumstances. With respect to that kind of matter, he would ask 'Is it necessary?' and I would say 'Yes, it is. You know, we do not have to circulate those pictures around to everybody. Competent people have to examine them,' and so forth, and he would accept that." (HSCA 3 p 738). 14 years after discussing the autopsy photos with Robert Kennedy, Katzenbach testified that Robert Kennedy accepted that competent people needed to examine them! Now here Willens, 35 years later, comes along to tell us that Katzenbach was not telling us the truth, and that Robert Kennedy had actually limited the number of people who could look at the photos to one--Earl Warren--who quite obviously lacked the competence to interpret them. Yikes. Either Willens was offering up a much-delayed correction to Katzenbach's testimony, when he was no longer around to argue, or he was to defending Warren (and the Warren Commission), at the expense of Katzenbach and Robert Kennedy. In any event, this concern led me to ask Willens if he could publish any memos he'd written on Katzenbach's meeting with Robert Kennedy. He responded: "I did not prepare any report other than what might be in my personal journal on the subject, which would reflect only what I reported in the book about my conversation with Katzenbach and the concerns of the staff." But this was misleading. There is no such report in Willens' journal. On 4-03-14, Willens published his personal journal on his website. His entry for 6-14-64 reads, in part: "(2) I spoke to the Deputy regarding the need for an appropriate member of the staff to gain access to the photographs made at the autopsy which the Attorney General was reluctant to have anyone see. At this time the Attorney General had agreed that the pictures could be seen by the Chief Justice, Mr. Rankin and one of the autopsy doctors." Now, wait a second. This is interesting right here. RFK had said it was okay for Dr. Humes to look at the photos? So why did Willens leave this out of his book? Was he preparing his readers for when he subsequently claimed RFK said that Warren and Warren alone could look at the photos? In his journal, Willens continues: "I told Mr. Katzenbach that Mr. Rankin had no need or interest to see these pictures, but that it was important that one of the members of the staff, Mr. Specter, who had been working in this area, be given access to these pictures. I mentioned the fact that Mr. Specter was known to the Attorney General as the prosecutor who tried the Ray Cohn case in Philadelphia and indicated to Mr. Katzenbach that he was a reliable person. Mr. Katzenbach said he would discuss it with the Attorney General on Friday, June 19, when the Attorney General returned to town." And that's it. There is no follow-up entry reporting on the results of Katzenbach's discussion with Kennedy. Nothing. Nada. Bupkus. It follows, then, that Willens' claim Katzenbach told him RFK said Warren had to look at the photos alone has no basis other than Willens' faint recollections of a discussion almost half-a-century before, written for a book designed to defend Warren and his commission. It's actually worse than that. In 1967, Edward J. Epstein, the author of Inquest, a 1966 book on the Warren Commission, for which Willens was interviewed, was himself interviewed for The Scavengers and Critics of the Warren Report, a stinging rebuke to his book written by Richard Lewis and Lawrence Schiller. On page 101, Epstein is quoted as follows: "The most interesting thing is that the Commission never saw the autopsy pictures and X rays, which are the basic evidence...When I was interviewing the lawyers, they all said they didn't see these, because Bobby Kennedy had refused to show them. But one of the lawyers, Howard Willens, checked his files and found Senator Kennedy never refused. It was Warren who didn't want to see them." So, hmmm, which are we to believe? Howard Willens' 50 years-on memories of something he never mentioned previously? For which he created no memos? And took no notes? Or Edward Epstein's 1 year-on memory of a discussion with Willens, for which Willens consulted his files? I would go with the latter. And it's even worse than that. On August 17, 1992, U.S. News and World Report published an account of the Warren Commission's investigation, written with the input of the commission's staff, including Willens. The article reported: "the Kennedy family resisted releasing images of JFK's mutilated corpse, in part to avoid further pain. Indeed, Robert Kennedy refused invitations to testify. 'I don't care what they do,' he told an aide. 'It's not going to bring him back.' With no photos to show the paths of the bullets, Warren decided to use drawings, based on the autopsy surgeons' recollections. Staffers complained that he was being too deferential to the Kennedys. Unknown to the young lawyers, Willens, who worked for RFK at Justice, kept pushing for access to the photos and X-rays. RFK has often been portrayed as blocking their release. But in mid-June he agreed to let Warren, Rankin and the autopsy doctors review them." Now, Willens was the obvious source for this passage. And it is in keeping with his journal--that Kennedy initially agreed Warren, Rankin, and a doctor could view the images. But it says nothing of what Willens later pushed in his book--the part not in his journal--that RFK subsequently told Katzenbach Warren would have to view the photos all by his lonesome. Well, it follows then that Willens had pulled this part out of a dark place...and that he probably should have washed his hands afterwards. In any event, in History Will Prove Us Correct, Willens continues: "Warren promptly arranged to have the materials brought to his chambers at the Supreme Court. He looked at them reluctantly and only briefly. He reported back to Rankin, and presumably the other commission members, that the photographs were so gruesome that he did not believe that they should be included among the commission's records." Well, wait a second. This is late June '64. On April 30, Warren and the commissioners had agreed that one of them should view the photos in the company of Dr. Humes. On May 24, Specter was shown the back wound photo. Specter told Shenon, moreover, that he suspected Warren had arranged for him to see the photo. Well, then, isn't if far more likely that Warren viewed the photos before allowing Specter to see the photo of the back wound, and at least a month before Willens presents him as viewing the photos? I mean, what's going on here? Why would Specter be pushing to see the autopsy materials in mid-June, weeks after he'd decided not to put his viewing of the back wound photo on the record, and weeks after he'd actually drawn testimony from Secret Service agent Thomas Kelley and FBI agent Lyndal Shaneyfelt suggesting both that the "inaccurate" "corpsman's" drawing was used during the re-enactment, and that the re-enactment supported its accuracy? Is Willens simply wrong, or is he blowing smoke? There is, of course, no mention of Warren's viewing the photos in Willens' personal journal. "Due to Warren's extreme distaste for these materials and his previous commitment to publishing everything relied on by the commission, Rankin concluded that there was no possibility of Specter being permitted to view these materials to confirm the accuracy of Humes' earlier testimony." Well, this is another head-scratcher. It totally avoids that 1) the transcript of the April 30 executive session of the commission reveals that Warren and Rankin AGREED that they could view the autopsy materials without publishing them, as long as they were using them to confirm previous testimony, and 2) the issue was not whether Specter would be allowed to view the materials, but whether Dr. Humes--the man for whom the materials had been created in the first place--could view the materials. On page 201, Willens further claims: "Specter did not learn that Warren had examined the autopsy materials until long after the commission report was filed." Now, this is interesting. If true, it suggests that Specter was afraid to say anything when shown the back wound photo in Dallas, and only later came to suspect Warren was behind his being shown the photo. If true, this suggests a surprising scenario, one so ironic it just might be true--that Specter was afraid to correct the record after seeing the back wound photo because he assumed Warren would not approve of this correction, while Warren took Specter's silence as an indication no correction was necessary. There's also this to consider. In his posthumously-published memoirs, Earl Warren writes: "In the last few years, although conspiratorial theories have borne no fruit, an attack has been made on the fact that pictures of the badly mutilated head of the President taken for the doctors do not appear in the records of the Commission now on file in the National Archives. It has been contended that the reason these pictures were not filed was because they would show that the shots which struck the President did not come from behind and above him. While I have never before entered into that discussion, I feel that it is appropriate to do so because I am solely responsible for the action taken, and still am certain that it was the appropriate thing to do. The President was hardly buried before people with ghoulish minds began putting together artifacts of the assassination for the purpose of establishing a museum on the subject. They offered as much as ten thousand dollars for the rifle alone...They also, of course, wanted the pictures of his head...I saw the pictures when they came from Bethesda Naval Hospital, and they were so horrible that I could not sleep well for nights. Accordingly, in order to prevent them from getting into the hands of these sensationmongers, I suggested that they not be used by the Commission..."
First, note the self-righteousness. Second, note that Warren focuses our attention on the photos of the head wound, and how horrible they are. Well, this totally avoids that he also prevented the public from seeing a photo of the back wound, or even a tracing of a photo of the back wound, or even a drawing made by someone who'd recently looked at a photo of the back wound. Third, note that he fails to admit that others had argued and that he'd agreed that the photos could be viewed by Dr. Humes and a commissioner without being published by the commission. Fourth, note how he says he "suggested" the photos not be used by the commission, when he in fact made the decision all by his lonesome, against the previously-stated wishes of his fellow commissioners. Well, when someone self-righteously tells us something that fails to acknowledge or align with the known facts I call that lying. Which brings us back to Warren... Fifth, note that Warren says nothing of Robert Kennedy's requesting he view the photos alone. And yet... I suspect Howard Willens is not lying, at least in the way most would assume he is lying, where he knows he's lying. Let me explain. While Willens' many "errors" smell like lies, they seem, to me, too brazen, and more probably a reflection of Willens' innate inability to come to grips with the many problems with the single-bullet theory, the theory upon which the Warren Commission's conclusions--and thus, Willens' reputation--rests. In our private correspondence, he insisted that he attached no importance to Specter's viewing of the autopsy photo, as he believed the location of the back wound in the photo to be fully compatible with the single-bullet theory. He had no interest in discussing this any further, of course. To his mind, the single-bullet theory works. Period. End of debate. Well, to my mind, this qualified him as a man in denial, terrible, terrible, denial, who is constitutionally unable to process and honestly present the medical evidence. So...at least for now, I'm giving the old man a pass...sort of. I mean, I know a lot of old geezers, myself included, who would much rather be called a liar than someone whose brain is unable to understand their own history. I am being generous on this. When one reflects on the comments of the Warren Commission's staff over the years, one is struck by an astounding fact. None of them have ever publicly acknowledged that Warren and Specter admitted they'd looked at a photo showing the wound to be in the back, and then said nothing when the commission subsequently published drawings in which it was presented at the base of the neck. In fact, as Willens, they have twisted themselves into knots to avoid doing so. As but one example, in his final book on the subject, Final Disclosure, David Belin admitted that Warren had made a mistake in not "submitting the physical evidence" (which in this context means the autopsy photos and x-rays) "to us" (which in this context means the staff). He then suggests this was because Warren had yielded to "the desires of the Kennedy family", and that the family had thereby "denied" the commission the opportunity to study the "best evidence". He then claims "Warren directed that the physicians furnish us their own drawings, which depicted what the photographs and x-rays showed" and concludes "this shortsighted decision helped breed the various false theories of assassination sensationalists." Well, heck. Let's fill in what he leaves out. Final Disclosure was written in 1988. 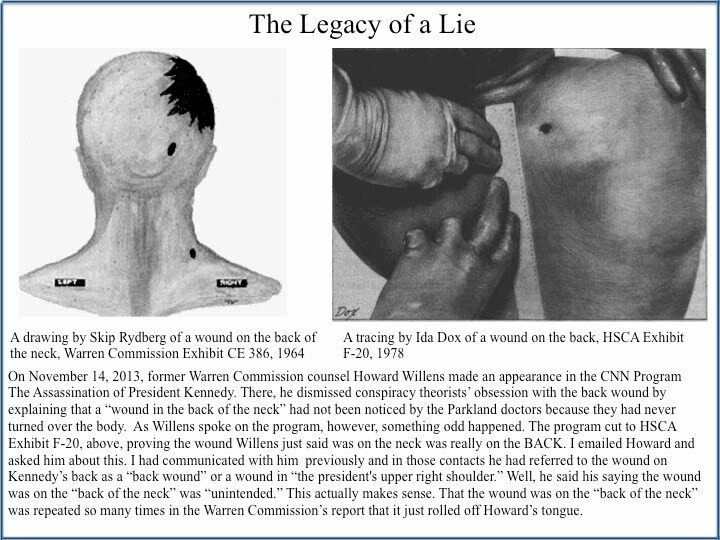 By 1988, it had already been established that 1) Warren and Specter had both seen the back wound photo before the publication of the commission's exhibits misrepresenting the location of the wound, and had had plenty of opportunity to correct this "mistake"; 2) it was not the Kennedy family but Warren himself who made the decision to withhold the photos and x-rays from both the staff outside Specter, and the doctors who'd created the photos and x-rays, for their own use; and 3) the problem was not that drawings that "depicted what the photographs and x-rays showed" were submitted instead of the photos, but that the drawings were created after Rankin said the commission would be seeking "help" from the doctors in explaining how the shots came from above, and that the back wound in these drawings was, hmmm, at the base of the neck, inches higher on the back than depicted in the photos, and that this "mistake" just so happened to "help" explain how the shots came from above. It seems clear, then, that Belin, in 1988, the 25th anniversary of the assassination, and then, Willens, in 2013, the 50th anniversary of the assassination, were running cover for Warren and Specter, and the commission as a whole. Belin, I suspect, knew exactly what he was doing. Willens, I'm not so sure. Specter, well, he's in even worse shape than Belin. Yes...to be clear, while it seems possible the octogenarian Willens was only deeply confused about the medical evidence, it seems near certain that a thirty-something Specter LIED about the back wound location. The back wound photo Specter begged to see and was finally shown shows a wound on the back, inches below the "base of the back of the neck," where Specter long claimed it resided--even after viewing the photo. When taken in conjunction with Specter's related behavior--his failure to tell the Warren Commission the back wound was not where it is shown in the Rydberg drawings, his taking testimony (which he knew to be untrue) suggesting that the accuracy of the Rydberg drawings had been confirmed by the May 1964 re-enactment, and his deferring to the accuracy of the autopsy measurements when speaking to U.S. News in 1966 (when the question related to the accuracy of the Rydberg drawings)--his repeatedly claiming the wound was at the base of the neck when it was inches lower on the back makes it abundantly clear that he lied, with the intention to deceive, in order to support the accuracy of the Rydberg drawings and convince the public the back wound was in a location consistent with his "Single-Bullet Conclusion." Patrick Speer began his studies on the assassination of President John F. Kennedy in 2003. He is the author of The Mysterious Death of Number 35 (2007), has spoken about the medical and physical evidence against Oswald at conferences in Dallas, Pittsburgh, and Bethesda, and has made repeated appearances on BlackOp Radio. He also maintains a website, patspeer.com, which features his thoughts on the assassination along with the largest collection of witness statements yet compiled.